For devices giving alarm signals, see Alarm devices. Alarm calls are often high-frequency sounds because these sounds are harder to localize, despite common belief. 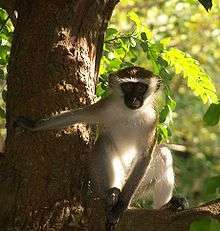 ↑ "Vervet Monkey Alarm Calls: Manipulation through Shared Information?". 94: 150–166. JSTOR 4534456. Retrieved 22 May 2013. ↑ Chivers, D. P.; Brown, G. E.; Smith, R. J. F. (1996). "The Evolution of Chemical Alarm Signals: Attracting Predators Benefits Alarm Signal Senders". 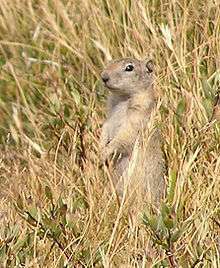 The American Naturalist. 148 (4): 649–659. doi:10.1086/285945. ↑ Woodland, D. J.; Jaafar, Z.; Knight, M. (1980). "The "Pursuit Deterrent" Function of Alarm Signals". The American Naturalist. 115 (5): 748–753. doi:10.1086/283596. ↑ Seyfarth, R. M.; Cheney, D. L.; Marler, P. (1980). "Monkey responses to three different alarm calls: evidence of predator classification and semantic communication". Science. 210 (4471): 801–803. doi:10.1126/science.7433999. PMID 7433999. ↑ Cheney, D. L.; Seyfarth, R. M. (1981). "Selective Forces Affecting the Predator Alarm Calls of Vervet Monkeys". Behaviour. 76 (1): 25–61. doi:10.1163/156853981x00022. JSTOR 4534091. ↑ Neyman, P. F. 1978. Aspects of the ecology and social organization of free-ranging cotton-top tamarins (Saguinus oedipus) and the conservation status of the species. In: The Biology and Conservation of the Callitrichidae (Ed. by D. G. Kleiman), pp. 39e71. Washington, D.C.: Smithsonian Institution Press. ↑ Fichtel, C; Perry, S; Groslouis, J (2005). "Alarm calls of white-faced capuchin monkeys: an acoustic analysis". Animal Behaviour. 70: 165–176. doi:10.1016/j.anbehav.2004.09.020. ↑ Zuberbühler, K (2000). "Referential labelling in Diana monkeys". Animal Behaviour. 59 (5): 917–927. doi:10.1006/anbe.1999.1317. PMID 10860519. ↑ Hammerschmidt, Kurt; Todt, Dietmar (1995). "Individual Differences in Vocalisations of Young Barbary Macaques (Macaca Sylvanus): A Multi-Parametric Analysis To Identify Critical Cues in Acoustic Signalling". Behaviour. 132 (5): 381–99. doi:10.1163/156853995x00621. ↑ Rendall, D.; Owren, M. J.; Ryan, M. J. (2009). "What do animal signals mean?". Animal Behaviour. 78: 233–240. doi:10.1016/j.anbehav.2009.06.007. ↑ Owren, M. J.; Rendall, D.; Ryan, M. J. (2010). "Redefining animal signaling: Influence versus information in communication". Biology and Philosophy. 25: 755–780. doi:10.1007/s10539-010-9224-4. ↑ Nordell, S. & Valone, T. (2014). Animal Behaviour: Concepts, Methods and Applications. Oxford University Press. ↑ Møller, A. P. (1990). 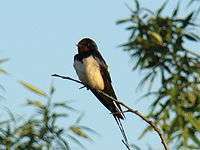 "Deceptive use of alarm calls by male swallows Hirundo rustica: A new paternity guard". Behavioral Ecology. 1: 1–6. doi:10.1093/beheco/1.1.1. ↑ Wickler, W. (1968) Mimicry in Plants and Animals (Translated from the German) McGraw-Hill, New York. ISBN 0-07-070100-8. p. 108. ↑ Seyfarth, R; Cheney, D (1990). "The assessment by vervet monkeys of their own and another species' alarm calls". Animal Behaviour. 40 (4): 754–764. doi:10.1016/S0003-3472(05)80704-3. ↑ Kobayashi, Y.; Yamamura, N. (2007). "Evolution of signal emission by uninfested plants to help nearby infested relatives". Evolutionary Ecology. 21 (3): 281–294. doi:10.1007/s10682-007-9165-9. ↑ Gibson, R.W. ; Pickett, J.A. (1983). "Wild potato repels aphids by release of aphid alarm pheromone". Nature. 302 (5909): 608–609. doi:10.1038/302608a0.